Our move to New York has me thinking about what clothes I’ll need to wear in the city. I always feel like people are so much more dressed up even in casual situations when I’m in NYC. Dresses are my everyday go-to’s because they’re an all-in-one outfit and, for the most part, I can wear dresses year-round in LA. But I’ve been to New York in the fall and I’m pretty sure I won’t be getting away with my usual one trick pony. 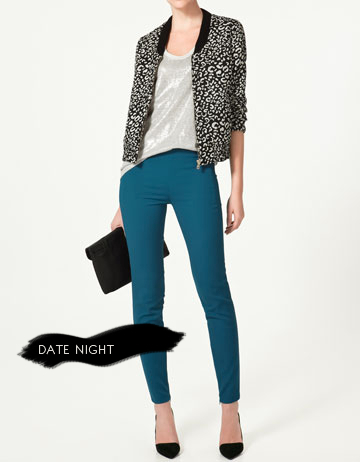 I love these blazer and pant combinations from Zara. They feel like fall in the city and something I can see myself in. What do you think? Would you wear any of these? I’d buy them all, but my votes for #1! Love the 2nd outfit! Not too crazy about the pants in the first one. I would wear the 2nd one. Agreed, pants in the first outfit are a bit out there but I love loose fitting, breezy pants…and the print sends me flying! Blazers are a must in NYC– I moved from CT/ NYC to SF last year..the fashion is so0o different no one dresses up in SF :-( I love blazer because you can dress them up or down dressed scarves, jeans heels sneakers or shorts! have fun!